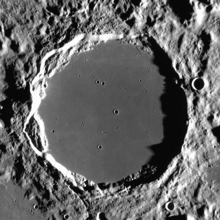 Plato is a lava-filled lunar impact crater on the Moon. Its diameter is 101 km. It was named after ancient Greek philosopher Plato. It is located on the northeastern shore of the Mare Imbrium, at the western extremity of the Montes Alpes mountain range. In the mare to the south are several rises collectively named the Montes Teneriffe. To the north lies the wide stretch of the Mare Frigoris. 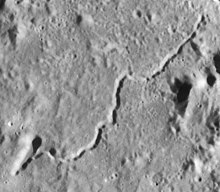 East of the crater, among the Montes Alpes, are several rilles collectively named the Rimae Plato. Plato has developed a reputation for transient lunar phenomena, including flashes of light, unusual colour patterns, and areas of hazy visibility. These anomalies are likely a result of seeing conditions, combined with the effects of different illumination angles of the Sun. Detail map of Mare Imbrium's features. Plato is the feature marked "C". Photo of Mare Frigoris. Plato is the dark circular feature to the south of the mare. Plato as taken from Lunar Reconnaissance Orbiter data, inset graph shows elevations of green line, left to right. By convention these features are identified on lunar maps by placing the letter on the side of the crater midpoint that is closest to Plato. Plato A — See Bliss (crater). The crater Plato is the location of an observatory in Arthur C. Clarke's novel Earthlight (1955), of the lunar "warren" Hong Kong Luna in Robert A. Heinlein's novel The Moon Is a Harsh Mistress (1966), and of Moonbase Alpha in the science-fiction TV series Space: 1999. Crater Plato is the home crater of Matthew Looney and Maria Looney, protagonists of the Looney series of children's books set on the Moon, written by Jerome Beatty. ^ a b "Plato (crater)". Gazetteer of Planetary Nomenclature. USGS Astrogeology Research Program. ^ "A cross section line trace of the lunar crater Plato, with an elevation graph of the line inset, from Lunar Reconnaissance Orbiter data". October 2, 2016. Retrieved October 18, 2017. Andersson, Leif E.; Whitaker, Ewen A. (1982). NASA Catalogue of Lunar Nomenclature (PDF). NASA RP-1097. Blue, Jennifer (July 25, 2007). "Gazetteer of Planetary Nomenclature: The Moon". USGS. Retrieved 2007-08-05. Bussey, Ben; Spudis, Paul (2004). The Clementine Atlas of the Moon. New York: Cambridge University Press. ISBN 978-0-521-81528-4. Menzel, Donald H.; Minnaert, Marcel; Levin, Boris J.; Dollfus, Audouin; Bell, Barbara (1971). "Report on Lunar Nomenclature by the Working Group of Commission 17 of the IAU". Space Science Reviews. 12 (2): 136–186. Bibcode:1971SSRv...12..136M. doi:10.1007/BF00171763. Webb, Thomas W. (1962). Celestial Objects for Common Telescopes (6th revised ed.). Dover. ISBN 978-0-486-20917-3. Wood, Chuck (March 15, 2004). "Peaks of Plato". Lunar Photo of the Day.